So much for keeping blog up-to date! 2nd of Feb was my last blog post. I have been on night duty which doesn’t help. Back again tonight so I thought I’d do a quick update before my eyelids hit the floor! Medication memorising seems to be going well! It is a lot of work but I don’t mind if it works. Here is an example of what I have been doing using Memrise as a learning aid. 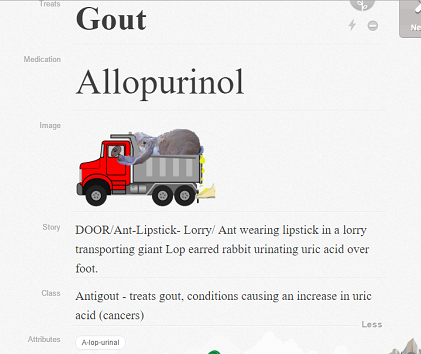 Result Allopurinol - antigout - treats gout and conditions causing an increase of uric acid.